The culinary arts have never been my forte. I consider putting together a basic casserole to be a great personal achievement. In an effort to improve my beginner-level cooking skills, I have assembled a list of cookbooks that are great for a beginner or someone who struggles to find the time to cook. 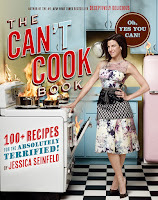 The Can’t Cook Book by Jessica Seinfeld is definitely aimed at beginners, but it still manages to offer a wide range of recipes. Along the way, the author includes some great resources to help support the reader as they attempt to cook. One of my favourites is a “how-to” section which offers tips and instructions for doing things like chopping and storing herbs. There is also a “quickies” section at the back with some fun, quick and healthy snack ideas. This book would be great for someone who is a beginner in the kitchen and is interested in learning to cook healthy meals. 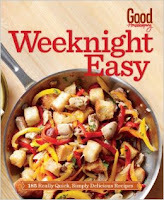 Weeknight Easy: 185 really quick, simply delicious recipes, is a recent Good Housekeeping publication. This book is aimed at those who struggle to put a meal together at the end of a busy day. Most meals are ready to eat in 30 minutes or less. My favourite sections include “Fix it and Forget it,” an entire chapter filled with slow cooker recipes, and “Wrap it Up,” which includes a variety of wrap recipes using tortillas or pitas, as well as great sandwich and taco ideas. This book is perfect for someone who doesn’t have much time or energy to prepare a meal, and would like some quick, delicious recipes. 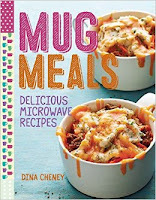 Mug Meals, by Dina Cheney, only includes recipes that you make in a mug using a microwave. This is my kind of cooking! I was happy with how simple and easy the recipes were, and surprised by the wide variety of meal options the author can make in a mug. This book includes recipes for breakfast, lunch, dinner and dessert. All you need is a microwave and a good sized, microwavable mug! 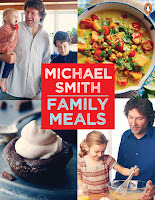 Michael Smith’s Family Meals, is a great cookbook aimed at helping families plan healthy meals with very little time. Throughout the book you can find tips and tricks for planning ahead, keeping your kitchen clean and packing lunches. One of Smith’s great suggestions is to create a large batch of “house red sauce,” or a basic homemade tomato sauce. By preparing it ahead of time, you would then have it ready to make a quick pasta dish on a busy night. Recipes are quite basic and designed to be easy to put together.